Roulette Wheel Terms is the second part of the roulette glossary and includes betting and payout information. Some of the terms that are unique to this international casino game include Big Number, Carré, En Plein, High Bet and Manque. Backtrack or Balltrack: outside stationary rim of the roulette wheel where ball is spun. Ball: a small plastic ball, spun in the opposite direction of the wheel's spin. This ball establishes payoffs for each spin depending on the number pocket it lands. Basket Bet: a 5 number bet on zero--double zero and numbers-1-2-3 which pays 6 to 1. This bet has a large 7.89% casino advantage. Avoid this bet as it is the worst roulette bet you can place! Biased Numbers: determined by biased wheels over the long run by appearing more often than others appear. Biased Wheel: flawed roulette wheel where specific numbers appear more often that probability of averages allows. Big Number: appears more often than probability of averages allows and is possibly an indicator of a biased wheel. Black Action: bet made with a black $100 chip. Black Bet: wager placed that the next winning number will be black. Bottom Track: inside slanted, stationary rim of the roulette wheel where ball moves downward before bouncing onto the wheel head and into a number pocket. Boule or Little Game: popular simple French roulette version with 9 numbers and 3 colors to place bets. Call Bets: grouping of numbers at single-zero tables. The 5 bets include number neighbors=5 chips, zero neighbors=9 chips, third section of the wheel=6 chips, full orphans=8 chips and orphans split=5 chips. Capping a Bet: dishonestly adding more chips to a bet that has already won, also known as past posting. Carré: French term for the corner bet—betting 4 numbers at once. Casino Edge: advantage casino on any specific wager. For roulette, the casino edge for double zero American wheel is 5.26%. Casino edge for single zero European roulette is lower at 2.70%. Chameleon Strategy: copying the betting patterns or strategies of winning players at the roulette table. Check Rack: tray that holds the chips for a game, also known as a chip rack or chip tray. Cheval: French term for the split bet, wagering 2 numbers at once. Choppy Game: roulette session where no streaks or patterns occur, thereby not favoring the house or players. Colonne: French term for column bet—betting one of the 3 columns. Column Bet: bet for one of the 3 columns consisting of 12 numbers on the roulette table layout. Bets are placed at the bottom of vertical column and a win pays 2 to 1. Corner Bet: wagering on four numbers at once that pays 8 to 1 for a win. Alternate terms are square bet or quarter bet. Croupier: French term for roulette dealer. Derniere: French term for 'last' referring to the last group of 12 numbers in a dozen bet. Double Row: betting on six numbers in two rows or ‘streets’ picked on the table layout. Win of one of these numbers pays 5 to 1. See line bet and six number bet. Double Zero: green number bet found on the American wheel. Double-Zero Wheel: has 38 numbers (0 and 00 and numbers 1-36). Dozen Bet: wagering for twelve numbers on the roulette layout at once. Examples: 1-12, 13-24, or 25-36. En Plein: French term for the straight-up bet—betting one number only. En Prison Rule: If the number zero is hit, this rule permits players to 1) take back half the bet or 2) leave the bet in place for another spin. Choosing this option (en prison) results in losing the entire bet if a zero hits with the following spin. This rule is for even money bets only. European Wheel: has only a single zero (0). Even Number Bet: wagering that an even number will hit on the next spin. Even Money: bet payoff is 1 to 1. Even money bets with the game of roulette are red, black, odd, even, low, and high bets. Ficheur: device used to separate different colored chips in order that each player receives a unique color to play. Five-Number Bet: betting on numbers 0, 00, 1, 2 and 3 at once located on the American Wheel. The high casino advantage of 7.89% makes this the worst roulette bet. Greens: $25 chips that are green in color. High Bet: wagering on the upper 18 numbers (19-36). Pays 1 to 1. High-Low Bet: betting on 18 numbers at once. Examples: 1-18 or 19-36. Pays 1 to 1. Impair: French term for the odd bet-- wagering that an odd number will hit on the next spin. 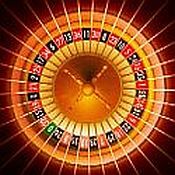 Inside Bet: placed on a specific number on the roulette table layout including 0 or 00, or any combination of numbers bet on the table layout. Opposite of outside bet. La Partage: unlike the en prison rule, the player loses half the bet, but does not qualify to leave the bet for a follow-up spin. This occurs with red/black, high/low, odd/even bets resulting in zero as the winning number. Layout: roulette table design on the felt table displaying the various betting options available. Line Bet: betting that one of six numbers in two rows or ‘streets’ picked on the table layout will hit. Low Bet: wagering that one the low numbers, 1-18 will hit on the next spin. Manque: French term for low bet—betting that one of the numbers 1-18 will hit. Martingale System: betting system where players double their bet after a loss. Not recommended. Negative Progression: game strategy of increasing bets after a loss. Not recommended. Nickel: $5 dollar chip that is red in color. Noir: French term for black bet or that the next winning number will be black. A. In order that consecutive numbers are nearly opposite each other. B. In numerical order around the outside. C. In numerical order, however 0 and 00 are opposite each other. A. Consecutive numbers are nearly opposite each other. For example, Zero is flanked by 2 and 28; on either side of 00 are 1 and 27. Roulette Wheel Terms is Part 2 of 3 for Roulette Glossary.